This year Nancy Nix-Rice is publishing an excellent series on optimising your clothes and accessories. This summer she suggested a basic mix-and-match wardrobe of 12 items, combined into nearly 100 outfits. Of course I thought it would be fun to look for patterns ! Though Nancy’s choices are such simple basics, if you have a pattern collection you probably have similar. Nancy uses a ‘Core 4’ of basic clothes : under-layer and over-layer, skirt and pants. She starts her wardrobe building with 2 of these Cores. Nancy starts with a basic group in your best dark neutral. She suggests your hair colour (Lesson 8). – a T-shirt and hoodie. – a tank and a linen shirt. – a silk blouse and a tailored jacket. – has a centre front opening which can be worn open or closed. – ideally can be worn alone (perhaps with a camisole). 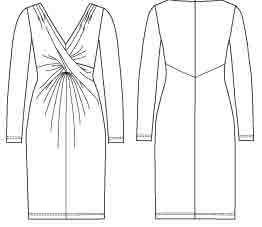 – worn closed but not all the way up to the neck, so the under-layer shows at the neckline. Remember an over-layer needs to be large enough to wear comfortably over your under-layers. So it needs at least 1 to 2 inches more ease at the underarm. All Nancy’s under-layers are sleeveless, but this isn’t essential. 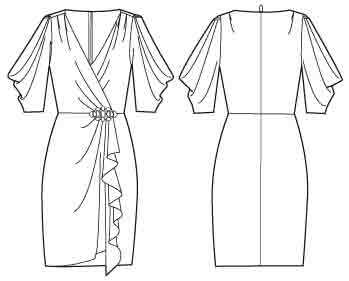 If you use under-layers with sleeves, the over-layer needs to have a larger armhole and sleeve. – a sleeveless shell with jewel or scoop neckline. – a short sleeved v-neck cardigan. There are surprisingly few sweater set patterns which meet both over-layer ‘rules’. Many cardigans have too low and loose a neckline to be wearable alone. Kwik Sew 2759 is shown with the cardigan alone. What are your ’go-to’ under- and over-layer styles ? I’m in the ‘short-sleeved top and shirt-jacket’ group. For a casual wardrobe you may like tee and hoodie. For a working wardrobe, you may want blouse and jacket. – a short slim skirt and a longer flowing one. 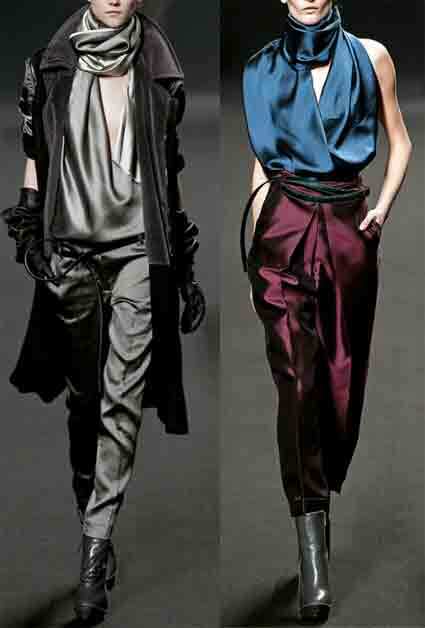 – dress pants and casual pants. Nancy chooses a straight skirt with a couple of knife pleats from hip level, so it looks like a six-gore skirt. There isn’t a current Big4 pattern like this. 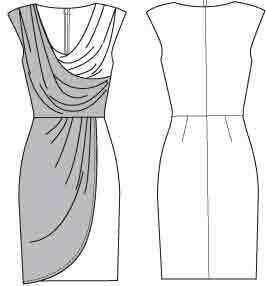 Easy to achieve if you know a little about pattern making. Cynthia Guffey has several skirt patterns with front pleats. Her pleats open lower and the pleats fold in a different direction but they could easily be adapted. This is s-4002. 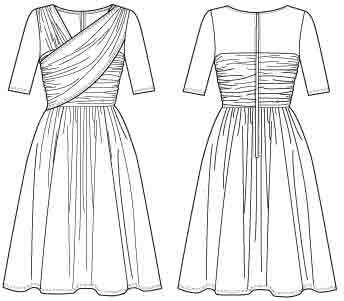 There are several Big 4 patterns for multiple pleats, such as Butterick 4686. These often have unpressed pleats, as short sassy styles. 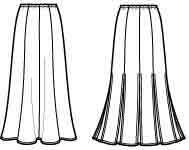 There are many skirt patterns which add flare below hip level. This gives a different silhouette. 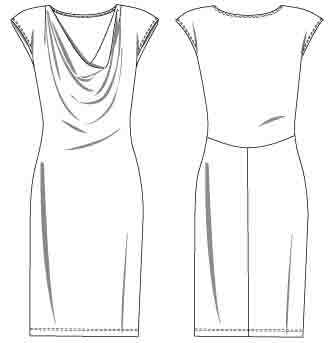 Simplicity 2451 was one of Pattern Review’s most popular patterns in 2010. This first skirt is the basic skirt of your wardrobe. So choose your go-to skirt style. Do you prefer straight, a-line, flared ? thigh, knee, calf length ? Nancy’s first pants are a classic tailored style. 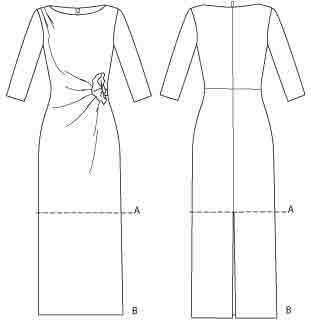 A good starting point could be Palmer-Pletsch McCall’s 5239 for Misses sizes, McCall’s 5537 for Women’s sizes. These include fit guidance, and three levels of sewing difficulty. What is your go-to pants style ? 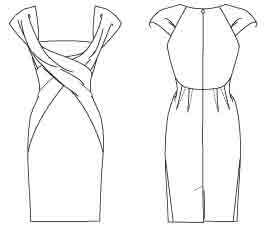 elastic or fitted waist ? natural or low waist ? waistband or faced waist ? front or back zip ? narrow, wide or shaped legs ? – a sleeveless knit shell with v-neck and twist trim. – a woven fabric short sleeved notched collar unlined jacket. Under-layer : There are many twist front patterns for knits and wovens. Most have sleeves. Raise the underarm if you want to make a sleeveless shell from a sleeved version. An under-layer needs a twist that’s not bulky under a closed over-layer. And a v-neck that’s not too deep to show when the over-layer is closed. Perhaps Jalie 2788 for knits (leave off the frill). Any added style element makes co-ordination more difficult. Instead you could use another simple top with different neckline – boat, scoop, wide V ? Over-layer : a short sleeved notched collar unlined jacket. Many patterns for blazers. The easiest unlined one perhaps is the short sleeved version of the 2-hour jacket, Butterick 4138. Hmm this one-button jacket isn’t ideal as it can’t be worn alone. Better a pattern which closes up to bust level. For her second skirt, Nancy chooses another pleated style, this time with box pleats from a lower level. You could adapt Simplicity 4881. 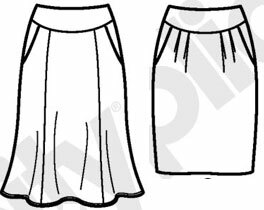 Longer skirts are current, but you could make it shorter and leave out the extra seams and pleats. What would be a slight variant on your favourite skirt style ? Or another skirt style you would love to include ? Or just change fabric type ? It’s easiest to co-ordinate if all garments of the same type have the same silhouette, see my post. This isn’t essential. 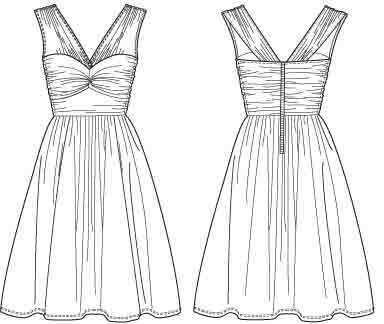 But if you choose one straight and one flared skirt, for example, they may not combine equally well with the tops. Nancy doesn’t describe her second pants style. Use a classic pattern again. 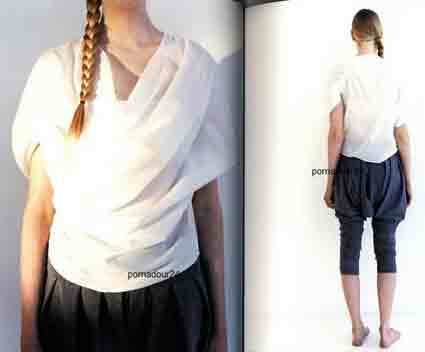 Or casual elastic waist pants. For easiest co-ordination, Nancy Nix-Rice says it’s best to start with all 4 items of a core, or pairs of (top + bottom) or (under-layer + over-layer), in colours that are closely similar. Nancy uses a darker and a lighter neutral for these 8 garments. But neutrals may not warm your heart. Imogen Lamport has a good section on colour personality. Perhaps your preferred wardrobe building background colours are ‘basics’ like plum, teal, peach, aqua, rather than neutrals. A ‘basic’ for one person may be an ‘accent’ for another ! Nancy mentions some problems when you use high contrast colours. Some stylists don’t use high contrast for this reason, see Imogen Lamport’s videos. No need to use high contrast if low contrast looks better on you. The Second Core items are lighter, but don’t need to be exactly the same colour (though Nancy shows clothes that are). Add interest by varying the colour slightly. Or use another colour for some pieces. Different but compatible shades. Easiest extra colour is one related to your neutrals, such as rust with dark brown and camel. To follow Nancy’s scheme, choose colours close enough to keep your ‘Color Columns’. And background shades. Nancy adds accent colours later ! Of course we haven’t got to follow Nancy’s suggestions exactly ! but use them for inspiration. So what is your core wardrobe group ? 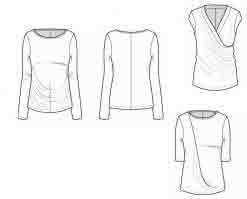 Judith Rasband in ‘Wardrobe Strategies for Women’ has a smallest ‘cluster’ of 5 items : add another under-layer top. dark fabric : jacket, skirt, pants, wrap dress. light fabric : top, skirt, pants. What are your own core basics ? dresses not pants ? tunic and vest as well as jacket ? Nancy has chosen the most classic of classics for her examples. Not for everyone. Do you prefer softer/ more relaxed/ sporty/ striking clothes ? I’ve already written much about personal style, summarised in recent posts on choices and modern personal styles. So far I’ve mentioned 8 of Nancy’s 12 wardrobe items. Read Nancy’s advice on combining and styling these. She makes 24 different looks from these 8 garments. Nancy’s core wardrobe has two groups of basics : one group darker and one group lighter. Background colours rather than attention grabbing accents. Plus accessories which link the two colours by including both. – few added style elements. – a small range of colours. These background basics are very simple. Not exciting statement clothes. YouLookFab has a piece on using classics as the background for other pieces. I have a post on the power of the boring. Cheer up 😀 Nancy goes on to add colour and print to the background basics. My next post in this group is planned on that. It’s not at all simple to find the clothes that work best for us. There are so many choices. And much of the advice out there isn’t good for everyone. So we have to try things out, and be able to move on when they aren’t right. pear/ triangle, inverted triangle, rectangle, apple/ round, hourglass. I have a whole lot of body shape features which aren’t dealt with by ‘easy fitting’ aids and aren’t mentioned in most books on fit. I’ve gradually learned about most of my fitting needs, but had some I was stumped on. Happily I’ve recently found the ‘big bible’ book “Fitting and Pattern Alteration” by Liechty, Rasband and Pottberg-Steineckert. It’s a great relief to know what my final fit issues are and what to do about them. Many people like the seasonal approach to personal colour. But it doesn’t work well for me – I’m a mixture of warm and cool. I use the colours from David Zyla ‘The Color of Style’. (Colours from hair, skin, eyes – my colour check is a lock from my salt ’n pepper hair.) Though I don’t use my colours in the way he suggests. And that too doesn’t work well for everyone. There are many other methods. Some people only manage to find ‘their’ most flattering colours by experimenting. There’s also good advice on colour and contrast from Nancy Nix-Rice. Imogen Lamport has much useful guidance about colour and body shape in her blog. Nearly all wardrobe plans are based round : jacket, top, skirt, pants. Very rarely there’s a mention of : jacket, dress, top, skirt. But what I wear is never mentioned : blouse, overshirt/ tunic, vest, pants. Jackets only for outerwear. Skirts only for special occasions. Happily the pattern companies are aware of this style, even if most wardrobe plan writers aren’t ! What are the items you like to wear ? See my post on a personal wardrobe plan. Some authors (such as David Kibbe and Judith Rasband) put all styles on a line from soft unstructured to angular tailored. I’m not happy with the idea that all human variety is one-dimensional ! And there are many different versions of the main style groupings – what type of ‘dramatic’: edgy, arty, fashionista, red carpet, vintage, hip-hop, goth, boho. . . ? I find it helpful to understand how my ‘minor’ styles affect my ‘major’ style. Okay I definitely wear casual clothes, comfortable and practical, but not sweats and sports gear or tees and jeans. I choose tunic-vest-pants rather than dresses or tailoring. But I like the soft textures and heirloom trims of a romantic, and the quality, basic shapes and neutral colours of a classic. For me, in most wardrobe advice books there’s too little on ‘casual’ styles. Many writers think ’casual’ means people who don’t care about clothes and need to brush their hair, put on mascara, and generally sharpen up. But that misses the majority of modern styles, which include many ways of feeling relaxed yet looking stylish. See my previous post on styles in the English shops this season. For ideas from a professional stylist see YouLookFab’s posts on individual style. She also has many interesting questions in her Team X or Team Y section. And there’s Imogen Lamport’s personal style section. Thankfully this is a simple option for me. I’m retired and wear informal clothes, which suits my personal style. Little need for businesslike, dressy, or exercise wear. Nowadays lifestyle is an area of clothing decisions where I don’t have to deal with a whole lot of complications 😀 People who love tailored clothes have much more difficulty finding a style they’re happy with when they retire. Do you prefer brights or neutrals ? contrast or monochrome ? see Imogen Lamport. What is most important to us about clothes – cost, comfort, fashion, effect on others ? see my post. And do you like to wear simple clothes, or ones with added style elements or embellishment ? No extras, or many accessories such as scarves, belts, jewellery, eye-catching shoes and bags ? A simple outfit or a complex one ? 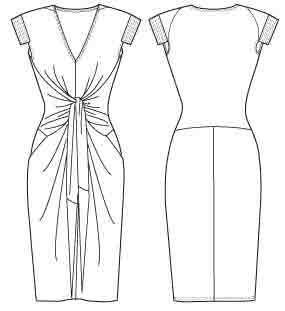 Do you prefer sewing that’s easy or advanced, quick or slow, knits or wovens. . . So which are the clothes it would be better to buy ? What is your method for helping yourself to ‘just do it’ when you get stuck ? So many choices, no wonder we have difficulty sorting it all out ! I usually don’t fit the simple alternatives. Don’t know whether this is a cause for despair, or whether it just makes it all interesting 😀 At least, after several years of trying things out and exploring, I am beginning to know what is right for me. Ruthie has recently written about her explorations of this too, in her blog. I’ve learned a lot from all the times I’ve had to rescue myself from forcing myself to follow advice that is not right for me ! Progress : there are some pictures in next week’s post !